The Rundown: The Gaslight Anthem is a U.S. Punk Rock/Folk Punk band from New Brunswick, New Jersey. 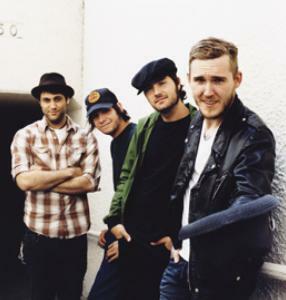 Started in 2005, the members of The Gaslight Anthem are Brian Fallon, Alex Rosamilia, Alex Levine, and Benny Horowitz. The band has released three albums: “Sink or Swim” (2007), “The ’59 Sound” (2008), and “American Slang” (2010). 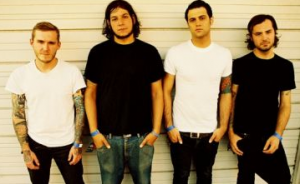 Influenced by the likes of Bruce Springsteen, the Misfits, and the Bouncing Souls, The Gaslight anthem has enjoyed a moderated success to date. They have appeared on the cover of British magazine Kerrang!, labeled “The best new band you’ll hear in 2008”. In 2009, the band won the 2009 Kerrang! Award for Best International Newcomer. Honestly, I don’t know why this band is considered Punk. There’s nothing even remotely Punk sounding in the albums I’ve listened to, but, you say po-ta-to, I say po-tah-to. 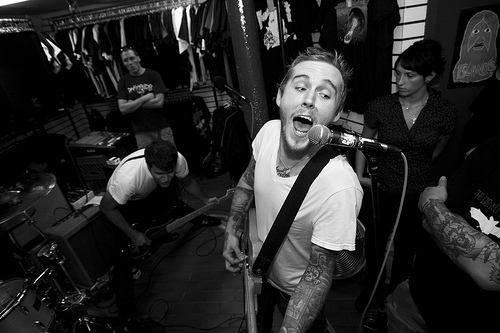 This band is so great because of their old-time sound, which is mainly because of the vocals of Brian Fallon. You also need to be sure to check out their cover of “Come Together“, it’s pretty awesome stuff. Other songs you need to check out are “The ’59 Sound“, “Bring it On“, “Tumbling Dice“, and “Great Expectations“. MarsBands.com also like this band because they released their album, “The ’59 Sound” on vinyl. The best way to listen to music is on vinyl, and that’s a fact. ← You Call This Music?